In 1965 he was called back to his Alma Mater Propagnda Fide College as its Vice-Rector. In 1969 he was appointed the Rector of St. Thomas Apostolic Seminary Vadavathoor, Kottayam. While serving as the Rector, in 1973 he was nominated Auxiliary to His Excellency Mar Sebastian Vayalil, Bishop of Palai. He was ordained Bishop on 15 August 1973 by His Eminance Joseph Cardinal Parecattil. 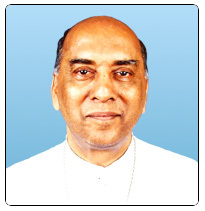 Bishop Mar Joseph Pallikaparampil took charge as Proto Syncellus of the Diocese on 22nd August 1973. Following the resignation of His Excellency Mar Sebastian Vayalil, the Holy See appointed his the Bishop of Palai on the 6th February 1981. On 25 March 1981, he was installed at the St. Thomas Cathedral Palai. After serving the diocese for 23 years, he handed over the charge of the diocese to his successor Mar Joseph Kallarangatt on 2 May 2004.